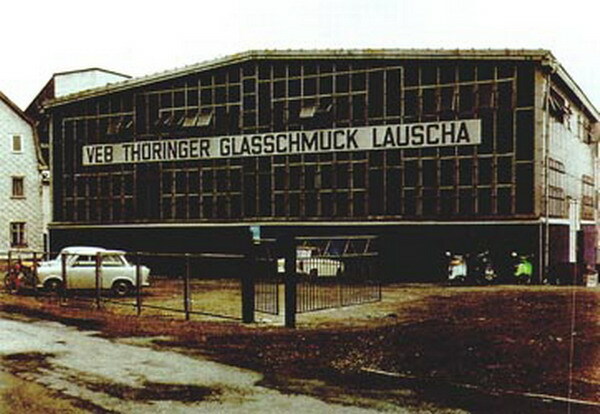 Lauscha was founded in 1597 when two glassblowers sought permission from the governing Duke to build a village glassworks, a glass “hut”. Since then, the material glass has been everything for people in and around this little village in the Thuringian Forest. Today, as in yesteryear, life for the whole village exists because of the glassblowers. The founding Glasblowers, from Swabia and Bohemia, found ideal conditions for a glass works – all the necessary raw materials. They started out making round components for leaded windows, apothecary jars and bottles, and drinking goblets. For the first 200 years, everything was made directly in the village glass “hut”. 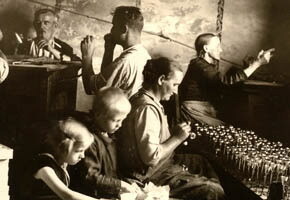 When the growing village could no longer be supported by the capacity of the hut, a home industry grew up, and production in the hut split into producing objects formed in front of the glass furnaces, and producing rods and tubes that the home workers used for their craft. In the middle of the 18th Century, lamp glass-blowing was introduced. This technology – blowing and forming shapes from heated glass tubes over an oil lamp – enabled the production of glass beads, mirrored with lead inside, and strung together, to make magnificent chains. The colored beads were also used for bridal crowns and hat decoration. In 1835, a Lauscha man, Ludwig Müller-Uri invented the first artificial human eye out of glass. Of course it could not restore the sight of an injured person, but it did give the person their natural appearance back. Glass eyes are still made and fitted in Lauscha today. It was probably a very poor Lauscha glassblower who could not afford the normal decorations of fruit, nuts and sweets to adorn his Christmas tree. So, he ingeniously formed simple hollow shapes over his oil lamp, and then later, in 1847, glassblowers in Lauscha began using molds to create more detailed shapes. 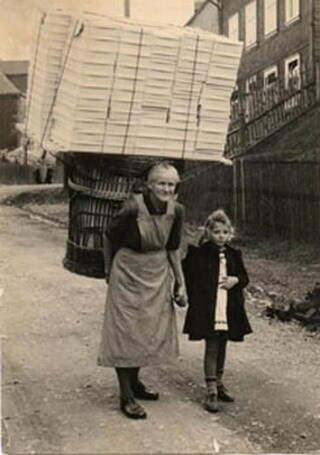 This was the moment of birth of glass Christmas tree ornaments that spread from this little village all over the world. Today Lauscha looks back on more than 160 years of tradition and artistry, and is rightly respected as the birthplace of glass Christmas ornaments. Very soon the new products became much more important because they traveled outside the family circle and became very popular as something to sell in quantity. In the archives of the Sonneberg Museum, there is a color catalog from the firm Ernst & Carl Dressel from the year 1860. This catalog has a large assortment of Lauscha glassware, and in the same catalog with the hollow beads, are pictures of larger round ornaments and olive shaped ornaments, with their mirrored coating of the early lead and tin, painted with thin layers of colored wax. Because of this catalogue, we know that as of 1860, Lauscha glass Christmas ornaments were already a stock item in the catalogs of the large Toy manufacturers in the nearby regional capital, Sonneberg. With new technologies and changes to workflow, production increased considerably. In 1867, a town gasworks was built in Lauscha and the oil lamps were traded for brand new gas burners. Next came a wonderful new technique to line the ornaments with pure silver, developed by Justus von Liebig. Around 1870, the first mold-blown articles were still being blown into wooden molds. At this time, ceramic molds were developed and then began to be coated with graphite, to allow a longer working time, and a finer surface. 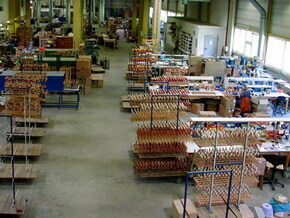 Many of the early molds have been preserved and are being used today, for both design and production. After individual glassblowers found out how much profit big businesses were making selling ornaments, the glassblowers began to work independently, and began traveling to establish contact with the customers themselves. 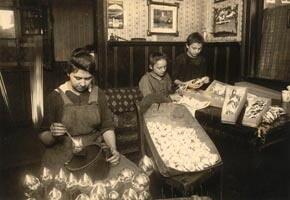 In the reports of the Sonneberg Chamber of Commerce of 1878-1882 there is an account of the exponential growth and positive public interest in the new ornaments produced in Lauscha, and praise for the new styles and colors that come out every year, that are being sold all over. Around 1880, the American business man, F. W. Woolworth, first became aware of the ornaments from Lauscha and sold the first set for 25.00 US$ in one of his stores in Pennsylvania. Ten years later, Lauscha glass ornaments were a resounding export success and by the turn of the century, Woolworth was ordering 200,000 shining ornaments per year. The first commercial art vocational school was opened in 1923 in Lauscha, to train lamp glass blowers. As the basis for the curriculum, the idea was that the beauty of the material should inspire the artisans. First, Expressionism, followed quickly by the New Objectivity, informed the new designs and shapes of hollow and solid glass forms. 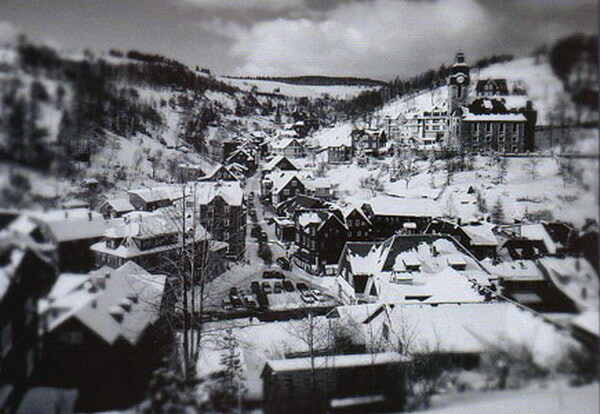 The time after World War II and the division of Germany into Western and Eastern zones had a great effect on Lauscha. Lauscha was in the Eastern zone, and suddenly, all export business had to be handled by the communist authorities. Production for export could only be done in state owned factories, and so a lot of production moved from tiny home workshops to huge factories. Sadly, most of the glass blowing was done by machine, not because the Lauscha glassblower lacked skill, but becauseEast Germanydesperately needed foreign currency, and glass ornaments, even machine blown ones, were still in demand. It is interesting to note, that the profession “Glassblower” and the apprenticeship that leads to the professional title, was still recognized after the war and during the occupation, in East Germany. The school is still a technical vocational school today, with classrooms full of future glassblowers. The Lauscha people have preserved their origins and originality. And today, there is still a glass hut, producing rods and tubes that home workers still use. Approximately every second family in Lauscha still makes their main living from glass. With new rules and regulations regarding industrial waste, the costs associated with environmental protection and the necessity to protect peoples’ health, it’s safer to produce Christmas ornaments in a modern, airy, studio instead of a small cramped workshop at home. But the flavor of family working together is still there. People work together their whole lives, laugh, lunch together, and take pride as a team, in the wonderful intricate work they do. Their techniques have been passed down to them throughout the generations. Many generations of Lauscha glass blowers have contributed to the growth and development of glass Christmas ornaments which have grown into a worldwide industry. Krebs Glas has an obligation as well as a passion, to preserve the tradition, and continue to move into the future with new collections.